On my last flight from Chicago, I paid for a first-class ticket (I don't have status with United). It was $278 one-way but, after I did the math, it was only $90 more than flying coach (considering all the add-on fees I would pay extra for, like checking luggage, etc), so it was worth it to me. Also, I had a nightmare departing flight that ended up lasting 7 hours (for a 2-hour flight), and I was traveling with my dog, which further justified spending another $90 to fly more comfortably. What it's like up in the front of the plane. Delta One goes coast to coast. Anyway, sitting next to me was a young girl who had never flown first-class before. She had a million questions (how did you get your tray table out of the arm rest? where's the power outlet? drinks are free?? ), which was adorable, and it inspired me to write this story. If it's your first time flying first class (whether you're upgraded like her or buying your own ticket), this is what you should expect. Oh gosh, what's back there?? Coach vs First. 1. Paying for a first-class ticket is not as expensive as you'd think. With airline wars at its most competitive, first-class fares are a lot cheaper than they were in the past. This is because airlines want to sell those seats rather than give upgrades. They keep the fares (based on route and demand) relatively inexpensive to actually sell the seats rather than give out the upgrades. Some times you can find first-class fares less than double the fare of a coach seat. Do the math. If you're not status on an airline, you already save $20-$25 for checking luggage, $15-ish for priority boarding, $10-$60 for premium economy and God knows how much for in-flight booze. The fare could be in your favor. Also, it's guaranteed you'll fly in first rather than develop a mild case of anxiety not knowing whether you'll be upgraded or not at the final hour. Peace of mind, y'all! I encourage you to look at first-class fares when you're booking your next flight. You might be surprised at how inexpensive it might be! 2. Yes, booze is free. Not only is booze free, you get a meal out of it too (depending on how long your flight is, generally three hours or longer). On every flight on most US airlines, they'll bring a basket of premium snacks, and you can go crazy here (it's unlimited, like a snack buffet). 3. Not all first-class seats are created equal. Obviously, the long-haul domestic flights (like LAX to NYC) will use better, more modern planes (lie-flat seats, seat-back entertainment, etc). I was on an older plane which didn't have seat-back entertainment, the power outlet was dated and didn't work and there were no pillows offered. But I still got the perks of a huge seat, better service, priority everything (see below). You'll notice how first-class seat fares vary when you're booking your flight, and this is often determined by the plane you'll fly (the better the plane, the more expensive). 4. That bathroom at the front of the plane is just for you. Well, it's intended for you but coach passengers will sneak up in and use it, and flight attendants rarely make a fuss. I wrote about this in my story Things You Do That Annoy Other Passengers. Even still, you never really have to wait to use the bathroom, and it's rarely a mess as far as plane bathrooms go. 5. You'll get better service. This is a given. While service on US airlines are notoriously meh (I think Delta Air Lines has the best service), first-class passengers are treated better. This is not rocket science. Expect flight attendants to call you by Mr/Mrs, and actually laugh at terrible jokes you might tell. 6. No fighting over overhead storage space. Can we talk about this for a second? Don't you get anxiety not knowing whether you'll have to check your luggage or not when you fly coach? Or don't you hate it when the nearest overhead bin with available space is about 30 seats away from you, so you have to wait until everyone is off the plane to get it? Booooo. 7. Priority everything. You will be grateful checking into the faster first-class counter, being among the first to board and using the priority security line if you don't have TSA Pre-Check. Also, you'll be the first off the plane and the first to get your luggage at baggage claim. Guys, doesn't flying first class sound awesome? 8. 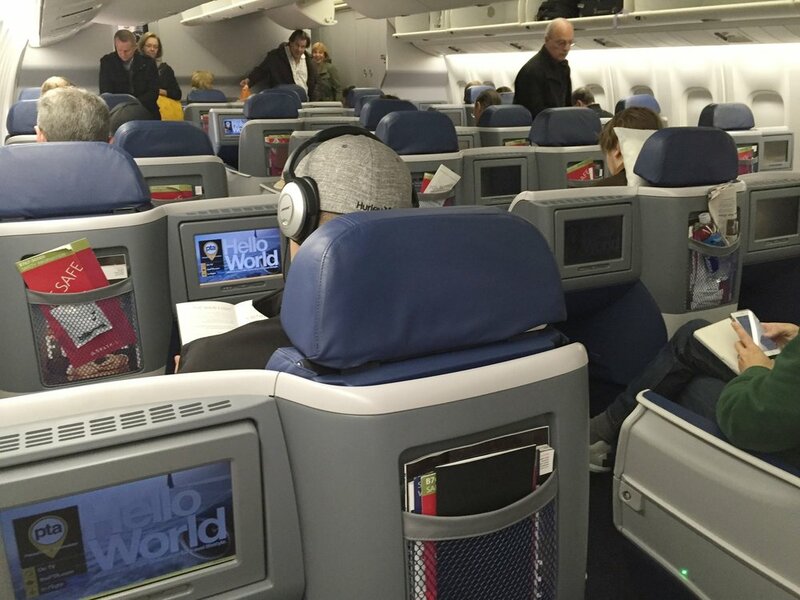 JetBlue, American and Delta have the best transcontinental first-class seats. JetBlue's Mint Class is notoriously posh, American's 777-300 is the plane used for international flights (so there is not only a great business class but an even more amazing first class) and Delta One is killing it. 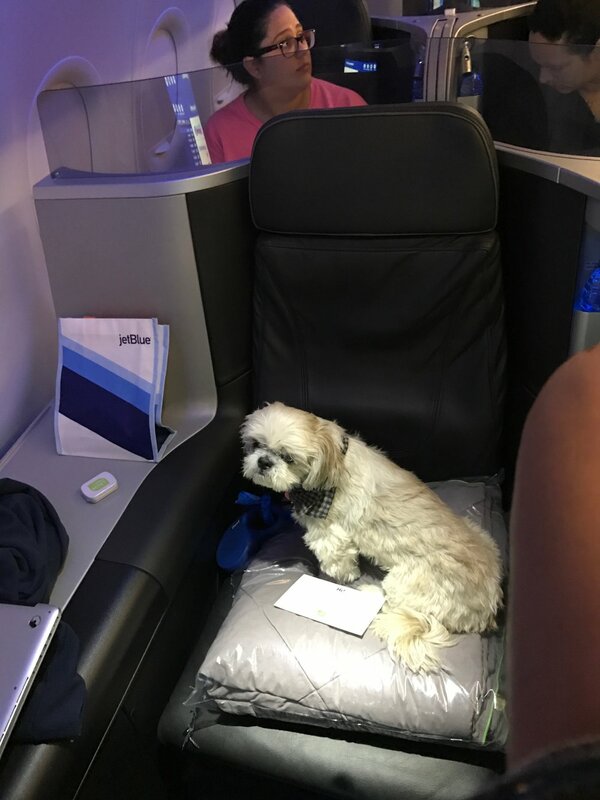 Ruby loves JetBlue's pet-friendly Mint Class.